Super DVD Creator was designed to convert and burn Avi Mpeg to DVD, Wmv to DVD, Xvid to DVD, Rm to DVD, Rmvb to DVD..., Super DVD Creator is the easy way to create your DVD VCD SVCD video disc. 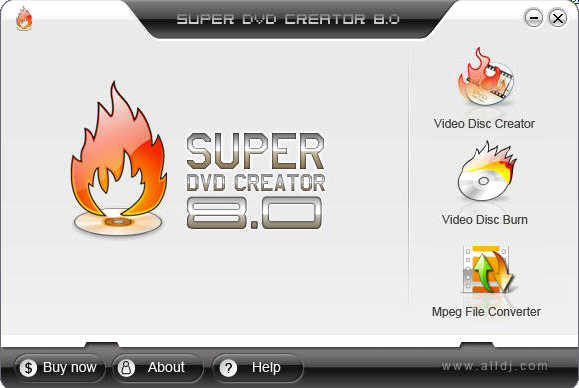 Super DVD Creator 8.0 was designed to convert and burn video movie files such as ASF Mov AVI DivX Mpeg Xvid Rm Rmvb Wmv to DVD VCD SVCD. Read More Detail about Super DVD Creator! Use this software to create VCD SVCD DVD from your digital video recorder, Webcam, or downloaded files. Super DVD Creator is a powerful, splendid and simple to use application for AVI Xvid Mov Rmvb Divx Rm Asf Xvid Wmv to DVD VCD SVCD video converting and Burning, you can use this software to Create VCD/DVD from your digital video Recorder, Webcam or downloaded files . Super DVD Creator FAQs - How to Create my first DVD ? a. video disc creator : direct make a DVD VCD or SVCD from source clips. b. Video Disc Burn : just burn the exist mpeg file to DVD SVCD or VCD disc. c. Mpeg file Converter : just conver souce clips Xvid Rm Rmvb Mov Asf Wmv to DVD SVCD VCD Mpeg1 Mpeg2 format, will not burn to disc . Add all the source clips into Source-list. And do some options as your like : set the begin point ,set the end point ,save picture .Note : Super DVD Creator support Multi-Audio Channels . if you source clips contain more than one Audio Channels you can specify to some one. a. choose your Working folder ,the output media will be saved to the Working folder before burn it to disc. So you need to set the Split size ,the software will split the output file to your specify size . and then you can use the burn function to burn to disc. c . When all the options is OK ,press the Start button and waiting for end . If your CD or DVD Burner did not work with the Super DVD Ceator ,you need download and install it. Unzip the ASPI.zip and read the read_me.txt how to install it. Support Rm Rmvb Asf Wmv Avi Mpeg Divx Xvid Mov media format. Burn Media file to DVD VCD SDVD Disc. XMedia DVD Duplicator Pro - Backup copies of your favorite DVD movies. DVD Easy Copy - Rip your DVDs and backup them up to CD! DVD Ripper Copy Pro Create and backup your DVD movies easily. AVI WMV MPEG Converter - Convert WMV to AVI, WMV to MPEG, Convert WMV to MPG Converter. Hot!